he 2018 British National and Open Championships took place in Pwllheli, Wales from 4-10 August and RVYC was represented by 4 cadets: Cam Blamey and Finn, Noah and Daisy Evans. In total there were 371 competitors from across the world with the USA, Bermuda, Cayman Islands, Hong Kong and Ireland sending their national teams to compete along with other competitors from Australia, South Africa, Belgium and Spain. As usual the fleets were split by age into Senior Main (U16), Junior Main (U13) and Regatta fleets. The format of the racing was for 3 days of qualifiers, a lay day and then 2 days of finals. Cam, Finn and Noah competed in the Junior Main and Daisy in the Regatta Coaching Fleet where you get coached in the morning and then race in the afternoon. Sunday dawned bright and sunny but with no wind at all. Undeterred, the main fleet set out with their packed lunches, drinks and sun cream, coming back 6 hours later with no races completed but lots of fun having been had. 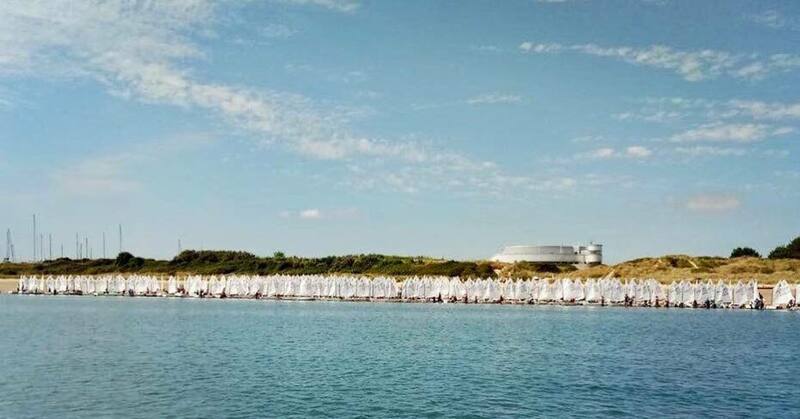 Monday and Tuesday brought yet more sunshine (very odd for the Welsh summer) and the Junior Main fleet were able to hold 5 qualifying races to decide how the 120 (90 UK and 30 overseas) competitors would split into Gold and Silver fleets. After some excellent results Cam and Noah qualified for the Gold fleet with Finn just missing out on Gold but being at the top end of Silver. After evening entertainment of human table football and bucking bronco surfing the RVYC team was ready for the Finals. Conditions were tricky to say the least on Thursday and Friday with the wind shifting 30 degrees regularly and varying in strength from 5-15 knots with a lumpy sea state. However, the Gold fleet managed 6 races and the Silver 5 races. Overall, Team RVYC had excellent results with Noah coming 11th in the Nationals and 23rd in the Open event (including overseas), Cam 20th in the Nationals and 38th in the Open event and Finn 41st in the Nationals and 68th in the Open event including a 2nd place in one of the Silver fleet races. The Regatta coaching fleet had a great time with 16 races completed (smaller courses! ), lots of free prizes including new sails, a follow the leader with a rib that had its own sound system that could be heard miles away and a lot of new friends being made. Overall, Daisy came 17th out of the 40 entries with a 2nd place in one of the races. Thanks again to Wightlink for their sponsorship.